Throughout the camp Donovan McNabb will offer tips and instruction, highlighting the finer points of football. Participants will experience various stations specializing in fundamental football skills and will participate in touch football games. Participants will be placed in small groups according to age to ensure that each child gets maximum instruction. Donovan McNabb is a former NFL quarterback who played for the Philadelphia Eagles, Washington Redskins and Minnesota Vikings. He is the Eagles’ all-time leader in career wins, pass attempts, pass completions, passing yards and passing touchdowns. 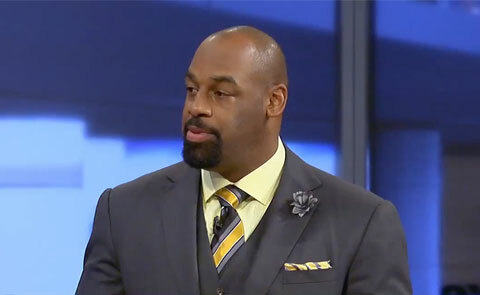 McNabb joined the NFL network as a broadcaster along with former players LaDainian Tomlinson, Darren Sharper and Shaun O’Hara on September 5, 2012. In a press conference on July 29, 2013 at Novacare Complex in South Philly, McNabb officially announced his retirement. Playing Field Promotions is a booking agent for motivational sports speakers and celebrities. If you would like to book Donovan McNabb for a personal appearance, contact Donovan McNabb’s booking agent for appearance & speaker fees at 1.800.966.1380.